Try a Windowsill Herb Garden | Starkie Bros.
Not all herbs do equally well indoors, but basil, bay, chives, oregano, sage, thyme, rosemary, parsley, dill, mint and cilantro are easy to grow, even for beginners. Choose the herbs for your windowsill based on your personal tastes for the herbs you will actually use as well as the available space you have for growing them. While small pots may look quaint for a windowsill herb garden, they don't always provide herbs with adequate room to grow. Either plastic or glazed pots are best, and they should include proper drainage for healthy roots. Choose the largest pots that will fit on your windowsill for a vigorous herb crop. Herbs can be planted as seeds or seedlings, and since they will be grown indoors, they can be planted at any time. Use a high quality organic potting mix with a good proportion of peat or coir in the soil so it will drain appropriately without rotting the roots of delicate herbs. 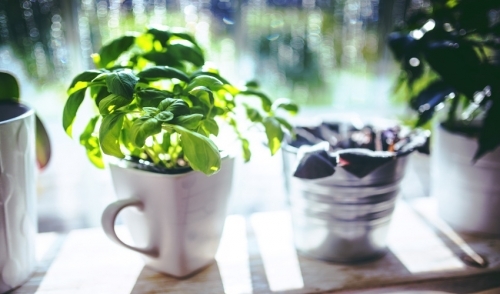 Potted herbs need six or more hours of sunlight each day, and should be positioned in either a south- or west-facing window for the best results. Avoid putting pots near air or furnace vents, and be sure the plants are not brushing against the glass, which can damage foliage. Soil should be kept damp until the herbs sprout, but be careful not to overwater herbs, which can rot the roots and kill the plants. Many herbs thrive in higher humidity, so adding a humidifier to the room or regularly misting the plants can help. Individual herbs have different watering needs, so be sure you are meeting their unique requirements. Herbs do not need much fertilizer, but supplementing the plants every other month can help them stay lush and vibrant. Use only about half the recommended amount of fertilizer, since too much fertilizing can actually dilute herbs' flavor and make them less appetizing. While it is necessary to prune herbs in order to use them, avoid pruning more than one-third of each stalk. This will help keep the plant bushy and full, growing more foliage that can be used rather than encouraging runners or stems. Once you have a thriving windowsill herb garden, you can regularly enjoy the herbs as flavorful additions to salads, sauces, stews, meat rubs, marinades and more. If you are growing more herbs than you can use, take steps to dry or freeze extra, and you'll never run out of herbs to enjoy.